‘Inspired’ members David Malone, Carmel Roche, Denise O’Mahony, Sinead Joy, Breda O’Sulivan, Eoin O’ Sullivan, Mary Flynn and Niamh O’Connor were out managing the flowers at The Imperial Hotel on Denny Street yesterday. Photo by Fergus Dennehy. MEMBERS of the local ‘Inspired Project’ have been helping to make the town a little more colourful as they busy themselves tending to the flower boxes all around the town. The group were out yesterday as they watered and managed all the various flower boxes that are now in many businesses windows, up and down Denny Street. The volunteers luckily caught the few hours of sunshine that we managed yesterday so there was smiles all around on the day for everyone involved. 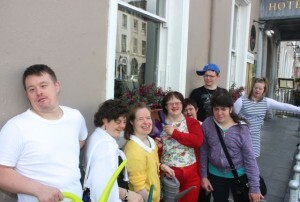 “Inspired is an ongoing community development project whose whole aim is to allow people with intellectual disabilities to become actively involved in their communities, to go on work experience and to show the people that they have such an ability to do things once they’re asked what they’d like to do,” said Yvonne O’Brien, a leading volunteer with the Inspired Group when talking to TraleeToday.ie yesterday. “We took on this summer project in conjunction with Tralee Chamber Alliance, Team Bramble and with sponsorship from Ballyseedy Garden Centre and there’s three aims to all of this. We are becoming actively involved in our community, we’re enhancing the town of Tralee and it’s worthwhile for the businesses as well,” she continued. “We’ll be doing the watering on Mondays, Tuesdays and Fridays, so it makes us very visible and it makes people more appreciative of our ability rather than our disability,” she finished.